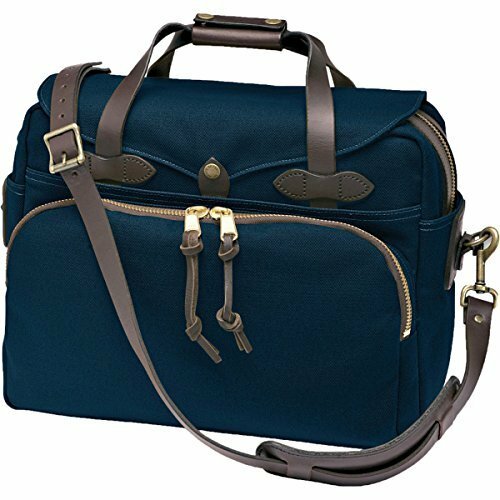 Filson used industrial-weight rugged twill, genuine bridle leather, and an oil finish to make the Twill Padded Laptop Briefcase. When you're taking plans to the field office or heading downtown for a desk-based day, the Filson Twill Padded Laptop Briefcase totes your tech and protects your papers. Ruggedly durable cotton twill resists drizzles and dirt due to the oil finish, and it wipes clean if someone is slinging mud your way. A padded compartment saves your laptop or tablet from the bumps and bruises of travel and leaves sufficient space for legal pads, documents, or carefully folded engineering plans. If you're traveling, for work or pleasure, this bag organizes everything. Two full-width open pockets on the outside put grab-and-go items well within reach, and two end pockets keep your smartphone (or multi-purpose tool) immediately at hand. A zippered exterior pocket offers organizational division, so your pens don't start a fight with your wallet. Inside, multiple full-length sections swallow documents with ease, even after you've secured your laptop. The bridle leather strap comes off if you're worried about wrinkling your shirt, and the bridle leather handles snap together for easy carrying.